One of the few remaining icehouses in the Warwick and Leamington Spa area is in High Street, Barford. A few yards from the east side of the house now called Little Watchbury there is a spinney of several yew and pine trees. In the middle of this slightly raised area there are 12 steps which lead down to an icehouse. The structure of the icehouse has similarities to some aspects of the cellars in the main house so I am starting by describing these as some possible clues as to when this icehouse might have been constructed. Icehouses were first introduced into England in the 1660s but clearly this one is not that old. At that time the dwelling which, later became Watchbury House, was the Tudor built wood frame and brick farmhouse building that can be seen from the road today. It is unlikely that the owners then would have considered having an icehouse even if they had been aware of the existence of such things. By late Victorian times, following two major extensions, this farmhouse had become a large house set in an estate of about 240 acres which included several farms. The first significant extension was around 1805 when a sizeable Georgian building was added at the rear of the farmhouse. The second was in the mid 1870s when there was a significant development of the whole estate. The owner wanted to turn it into a high quality house by addition and modification but without completely rebuilding it. The Georgian part was redesigned and a number of alterations were made to its structure. Also there were other extensions to the main accommodation and buildings were added to other parts of the estate. So much so that in the 1970s the Local Government officer who had the task of recording all the local listed buildings said he didn’t really want to include the Watchbury House buildings because they had been ‘modernised’ – in the 1870s!! However, the rules said that he had no choice. A basic cellar was added under the Tudor part during one of these developments, possibly during the early 1800s. This has a vaulted brick roof and a cambered brick floor which allows any water to drain away. It has low brick shelves or ‘settles’ along either side; presumably for storage of barrels of beer, preserved food, etc.. There are also some cellar spaces of a different design and using different materials. These extend below the Georgian section as well and are therefore likely to have been added during the 1870 changes. For example they include a formal wine cellar which has a number of brick built wine bins, each with its own ceramic number plate. There is a separate cellar at the east end of the house. It is accessed by outside steps which are partly made of Staffordshire Blue Bricks. This cellar also has a flat brick floor which allows water to drain away. There is a metal cover at ground level with a chute into this cellar; so it clearly was built as the coal cellar to supply the fireplaces that were in most rooms of the house. Now it is where the hot water and central heating boiler is installed. This is a part of the 1870s upgrade. The effectiveness of an icehouse depends on the fact that soil provides very good heat insulation. The temperature inside an underground cellar only rises very gradually due to warmth from the outside. Thus if the cellar temperature is artificially lowered by storing a great deal of ice during the winter it will not be completely melted until late spring or early summer. So the basic design requirements are a sufficient depth of soil around it and a floor that provides an effective ‘soak away’ facility for the slowly melting ice. They are usually built a distance away from the warmth of living quarters. The other fundamental requirement is a supply of ice which one assumes was originally expected to come from the nearby River Avon. 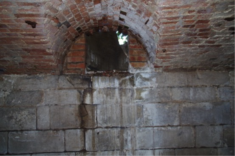 The basic structure of the Watchbury House icehouse is very similar to the original cellar in the house, that is to say with vaulted brick roof though with a flat brick floor. This leads me to think that it might have been first constructed around the time of the original house cellar in the early 1800s. But it has a number of similarities with the materials used in the cellars created in the 1870s which at least suggests that it was improved then. However it is also possible it might have been started at this later date. The brick sizes might be a clue to an archaeologist. 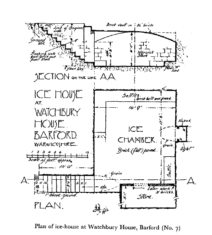 Mr F W B Yorke, an architect from Stratford-upon Avon, wrote a detailed paper describing a number of Icehouses in the Midlands which included a formal architectural plan of the Watchbury Icehouse showing the dimensions (see Figure 2 below). He also gives a precise architectural description which I have reproduced here. ‘The ice-house is oblong-in plan, measuring approximately 19 ft. by 14 ft. 9 in. and 4 ft. 4 in. high to the springing and 6 ft. high to the crown of the brick vaulted ceiling internally; the internal walls to the height of the springing of the vault (4 ft. 4 in.) are built in Warwick stone. The vaulting itself is constructed in fine 2 !/4 in. bricks. The chamber is reached by a 3 ft. wide stairway of twelve brick steps vaulted over to about 2 ft. beyond the springing line of the main vault only, and groined for the stairway. It is lighted on the opposite side, approximately centrally, by a small window, which again the main vault is groined to admit, a small light area being formed externally. The floor is paved with brick laid flat, and a 1 ft. 9 in. wide settle runs partly around the walls, which rather suggests the chamber may have been used at some time for salting and curing. The vaulting is covered externally by a bank of earth which is planted with shrubs, chiefly yews. 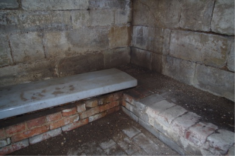 There is a cupboard space formed at the entrance end of the chamber of later date, constructed of 3 in. bricks, which obtrudes upon the original stone walled end. Within this cupboard, at the extreme end of the original chamber, there remains a 2 ft. square opening formed in the centre of the vaulted ceiling for the admission of the ice. The original flap doors to the entrance have disappeared and the opening is now covered with corrugated iron sheets. The entrance to the icehouse is still covered by two large overlapping sheets of corrugated iron to protect it from direct rain and for safety reasons. The 12 steps down to it are partly made of Stafford Blue Bricks similar to the those used in the coal cellar. This suggests that it was either built as a quality feature at the time of the 1870s house upgrade or that it was an earlier facility which was modified in the 1870s. The feature described on the plan as ‘light’ is an unglazed but barred window presumably for ventilation. Some pieces of slate now cover the outside. It can be assumed that the ice was brought by carts from the River Avon though nowadays it rarely freezes over. Its nearest point is probably less than 200 yards from the Icehouse; however this route was up a very steep slope and it is not known if there was a track there. There was at least one mill in the area where there would have been access to the river. However the miller would have wanted to keep the water flowing and he would have been helped by the weir. Otherwise there were a couple of tracks to the river from Church Street . Of course there would have been good access alongside the bridge. Whichever part of the river from which the ice was collected it would have been a very heavy task for the men and the horses and it would have needed many cartloads to fill the icehouse. It is very likely that the icehouse was used as an air raid shelter when Coventry was being so heavily bombed in the early 1940s. The house was occupied at that time by Mr Kenward Barker and Mrs Mary Barker with seven other adults living in the house (see 1939 Survey). 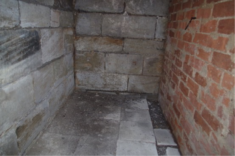 The section on the plan described as ‘later work’ and ‘store’ and made of ‘3” bricks’ may well have been modified during the early part of the 1939-45 war to provide a little privacy for a chemical toilet while the icehouse was being used as an air raid shelter. As well as there being different sized bricks here, there is also a different floor. It is covered with what appear to be perforated larger ‘tiles’. They could be similar to some used in the wine cellar. At this stage we are not sure what is underneath these. There is no sign of there being the remains of an entrance to a tunnel at the north end of this section as suggested by Mr Yorke. The only changes made during the present occupancy of Little Watchbury is that a builder did some touching up of the ‘pointing’ on the vaulted ceiling. And the corrugated sheeting has been renewed. This page was added on 05/12/2018.